I am an herbalist and an activist; for me it is very important to connect my commitment to natural health care to my commitment to participating in groups who are doing work for social change. Thus when Kasi, of the Asian Prisoner Support Committee, asked me if I would offer a workshop on Local Medicinal Plants to members of APSC’s Roots 2 Reentry group, I felt it to be a uniquely edifying honor. And so, on April 5th, I had the opportunity to lead a group of half a dozen participants into the woods at Joaquin Miller Park, and there explore and connect with the plants. We began the walk in quiet, taking time to listen and feel the energy of the woods. It is a beautiful time of year, with so much coming into bloom. We saw many wonderful and healing plants, including Bay Laurel, Wild Ginger, Huckleberry, Coastal Sage, and, of course, the indomitable, majestic Redwoods. I shared what I know of these plants as sources both of physical and spiritual medicine, and in return found that many other folks had natural knowledge of their own to impart. After walking for a while, all along the way talking about the medicinal benefits the various plants had to offer, we went off trail to a gorgeous open space and took some time to individually explore the beauty around us. Beforehand, Harrison had asked each one of us in the group to think about a plant she or he has cultural connections with. And then, when we all gathered back together, we each took turns sharing the knowledge and experience we had around plants that have had meaning in our lives. Then, to rejuvenate our bodies, I offered up Chamomile tea to drink, harvested from my own garden. And we couldn’t help but continue talking about how healing it is to be able to be with nature so close to the city, and thereby connect to life in a different way. A moment that profoundly stood out to me was when Vu shared that, after being in prison, where there is a nearly total absence of nature, it had an indescribable effect on him to be in the woods where everything was, contrary to what he had come to be used to, so alive. Indeed, it is profound how much we as humans are cut off from nature—whether in the acute case as punishment within the prison system, or as a general way we are conditioned to be within a capitalist society. We are made to rely on medical systems and agricultural systems in which we are reduced to passive patients and passive consumers. But as a gardener, herbalist, and activist, I work towards justice by seeking to make information accessible to all on the transformative practices of growing your own food and providing your own medicine. It is inspiring to me that APSC incorporates knowledge of healing practices into their re-entry work. I am left hoping and believing that more practitioners of natural medicine will be able to connect with communities like APSC to support all people getting access to affordable health care that is not dependent on top-down modes of delivery. Finally, at the end of our sharing circle, Henry led us in a song of care for the Earth. 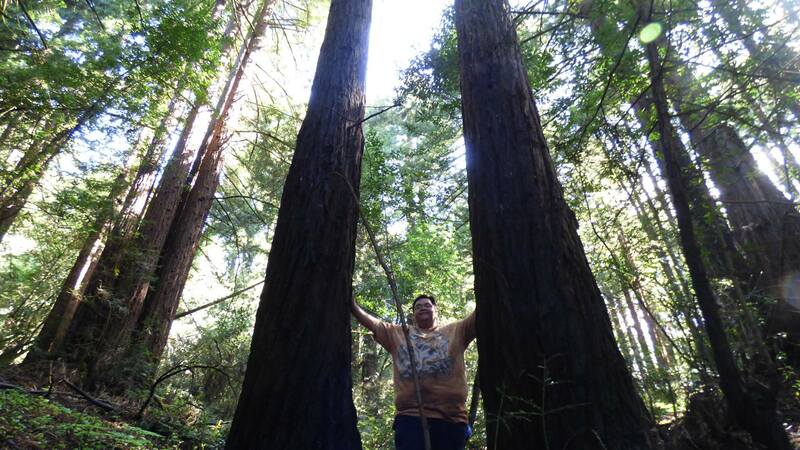 He shared that his people and culture believe they come from the heart of the Redwood trees, and emphasized how it was special to be in the Redwoods on that day. 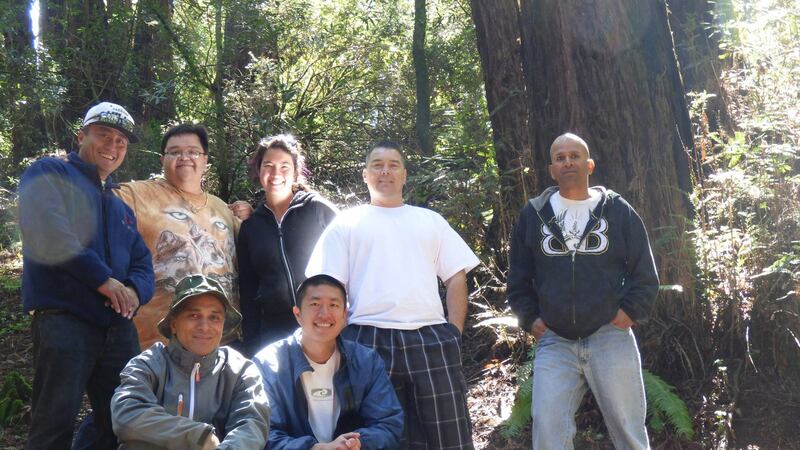 I am deeply grateful to the Asian Prisoner Support Committee for giving me the opportunity to share the healing medicine of plants with the Roots 2 Reentry group; and I am equally grateful to each of the folks on the hike for sharing their stories and knowledge with me.